The initial RUDDER model consisting of a single software block which includes all features, thus imposing a greater and greater complexity on all of our users, has reached its limits. We have now reached a sufficient understanding of the domain, its challenges, and the way RUDDER is used, to make us realize that this all-in-one model is not, or is no longer, the best suited. Version 5.0 introduces a plugin ecosystem that gathers RUDDER’s most specific features. This way, only essential features have to be installed by default and advanced features can be used on a case by case basis. So what is essential and what is not? The basic rule is that the essential experience must contain the features used by 80% or more of users, whatever the scale of use. 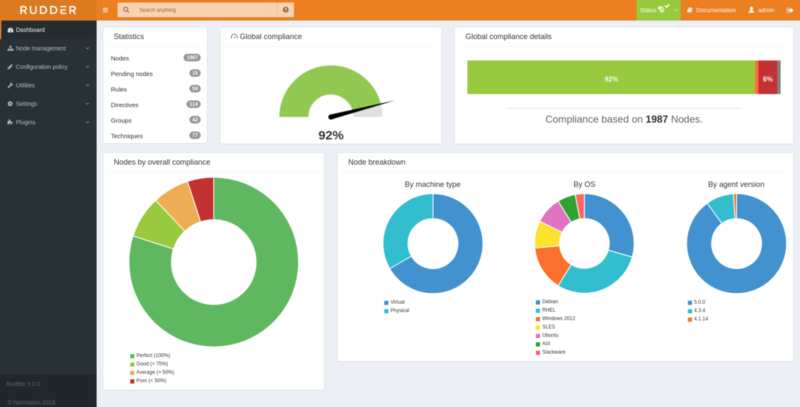 In other words, we keep as core features everything that delivers on RUDDER’s initial promise: enabling users to continuously audit and enforce configurations with an easy to use webapp providing visual reporting. The remaining 20% solve needs that are no less important, only less common (PDF compliance reports, UI branding, scale-out relay servers, validation workflow…). We provide integration with third party tools as plugins, making RUDDER more integrated with tools like Ansible, Centreon, Zabbix, GLPI or HashiCorp Vault. Welcome to our brand new documentation website docs.rudder.io! Beyond its fresh look (both on the online website and in the embedded version), this new documentation includes updated content and new resources, like a “getting started” guide and examples of use-cases. Antora to generate documentation. We simply had to create a RUDDER theme. Even if it is a young project, and we had to workaround some limitations, it was a really good discovery! We built a new REST API that allows to manage some advanced settings and perform maintenance operations in RUDDER, like triggering policy generations, updating dynamic groups and managing report archives. This was previously available in the now deprecated V1 API (https://docs.rudder.io/history/4.3/rest-api.html#rest-api) which will be removed in the next major version (5.1). Techniques provided with RUDDER can now be automatically upgraded when you update RUDDER. This process used to be manual because you might have modified the base Technique Library and we thought you may want to have more control about the content of your Technique Library. But it appears that this process was forgotten by a majority of our users and so many bug fixes and new versions were not available after an upgrade. By default this feature is enabled on new RUDDER 5.0 installations but is disabled on upgrades from older versions, to prevent any accidental damage. Our general policy is to maintain major releases until 3 months after the next major version is released to give some time for upgrading. The ESR tag was previously given to major releases that were maintained 6 months after the next ESR version was announced. RUDDER 4.1 is the last ESR release. For a slower major upgrade pace, RUDDER subscription provides long-term maintenance up to 24 months after release (depending on the subscription level) for RUDDER versions. RUDDER subscription also includes binary package for specific needs like ARM systems, Slackware, etc. Relay server support is now part of an open-source plugin, pre-compiled packages are available as part of the RUDDER subscription. The agent package is now more modular: instead of embedding all dependencies, we are using system libraries on maintained operating systems, to allow for a better system integration. As a consequence, the experimental rudder-agent-thin (which had this exact goal) package is not built anymore. 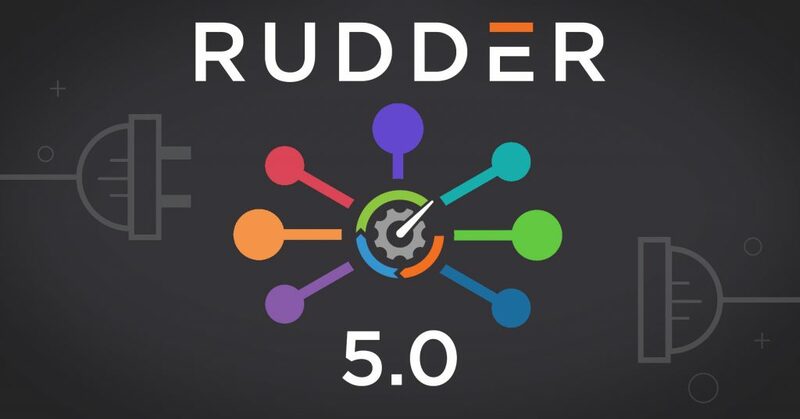 RUDDER 5.0 is available now! Linux server packages: The easiest way to test and use RUDDER for prototyping or production is to install it from the provided Linux packages. For the server, the main current .rpm-based (RedHat, CentOS, SLES) and .deb-based (Debian, Ubuntu) distributions are supported. See https://www.rudder.io/en/rudder/download-rudder/ for details about repository and available versions. Because of the new regulation about personal data, we invite you to subscribe to our english-speaking newsletter . If you already signed up in the past long ago, fill up and submit the form once again to confirm you want to be kept informed about RUDDER news. If you don’t there is a chance for you to be removed from our database because of the new data retention period legislation.